Cesar Chavez (center), leader of the United Farm Workers, with Msgr. 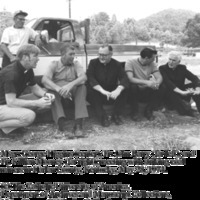 George G. Higgins (right of Chavez), and Bishop Joseph Donnelly, Chairman of the U.S. Bishops' Committee on Farm Labor (left of Chavez), at a news conference in Fresno, California, discussing the settlement of the grape dispute between the UFW and over forty growers, May 21, 1970. Msgr. George G. Higgins (center), Fr. John Barry (far left, and Fr. Killian Mooney (far right), meeting with striking coal miners in Harlan County, Kentucky, May 28, 1974. Msgr. George G. Higgins (at podium) with labor leader George Meany (immediate left, seated), at a press conference for the Coalition for a Fair Minimum Wage, 1977. Monsignor Higgins was born in 1916 in Chicago and ordained for the Archdiocese of Chicago in 1940. He studied at the Catholic University of America in Washington, DC, obtaining a Master's degree in Economics in 1942 and a Ph.D. in 1944. He served on the staff of the National Catholic Welfare Conference (NCWC), now known as the National Conference of Catholic Bishops (NCCB)/United States Catholic Conference(USCC), from 1944 to 1980 and was Director of their Social Action Department, 1954-1967. He served with and was much influenced by Msgr. John A. Ryan and Fr. Raymond McGowan, both important figures in the field of Catholic social thought and labor relations. He was elevated to Papal Chamberlain with the title of Monsignor in 1953 and was named a Domestic Prelate in 1959. 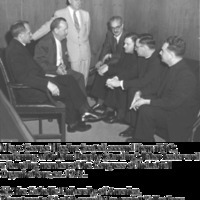 Upon the advent of the Vatican II Council, Higgins used his experience and knowledge for the Preparatory Commission on the Lay Apostolate and as a Consultant to the Council. Always a champion of human rights and economic justice for all, especially farm labor where he was the moving force in the Church's support for Cesar Chavez and his union movement, Higgins served in several committees, including the Bishops' Committee for Catholic-Jewish Relations, the Bishops' Committee on Farm Labor, Chairman of the Public Review Board, United Auto Workers of America (AFL-CIO), member of the American Arbitration Association, Executive Committee member of the Leadership Conference on Civil Rights, member of the Board of the Martin Luther King, Jr. Fund of the United Farm Workers, and Advisor to the Chairman of the U.S. Delegation to the Belgrade Conference on Human Rights. Higgins brought his expertise to the classroom, lecturing for both the School of Social Science and the Department of Theology at Catholic University. 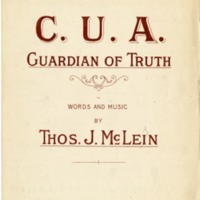 In addition to these activities, Higgins wrote numerous book reviews for Commonweal and America, and was the author, 1945-2001, of the syndicated column "The Yardstick." On August 9, 2000, at a White House ceremony, President Bill Clinton honored Msgr. Higgins, among several other notables including Simon Wiesenthal and John Kenneth Galbraith, with the Presidential Medal of Freedom, the nation's highest civilian honor. Msgr. Higgins was selected because of his nearly 50 years of service to the cause of justice for workers and his widespread recognition as the 'labor priest' and point man for the American Catholic Church in this regard. He was honored with the University of Notre Dame's Laetare Medal in 2001 and died on May Day, 2002, after a long illness. He was widely mourned as a tireless champion of the labor movement and a progressive voice in the Roman Catholic Church.